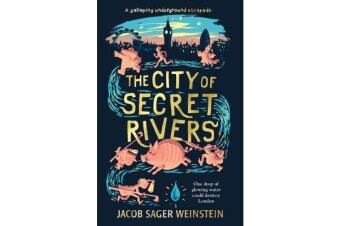 An exciting subterranean London adventure, the first in a middle-grade trilogy. Hyacinth Hayward has recently arrived from America and is having difficulty adjusting to her new surroundings, especially being in the sole company of her eccentric mother. Everything feels strange. Very strange. And it gets stranger the day she accidentally unleashes the power of a secret river running through London. To prevent a second Great Fire, Hyacinth needs to retrieve a single, magically charged drop of water from somewhere in the city sewer system. Along the way she encounters an eclectic cast of characters – the shambling, monstrous Saltpetre Men who kidnap her mother, the Toshers who battle for control of magical artefacts and a giant pig with whom she has a tea party. The clock is ticking – will she figure out who to trust?